If you didn’t read my last post (it is brief) take a look: Do you have an active mind? because this continues thoughts from it. 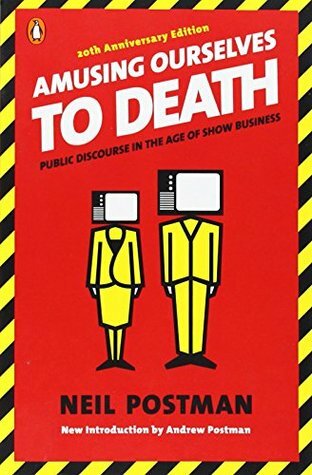 Since originally writing that post I finally read Neil Postman’s classic book: Amusing Ourselves to Death, Public Discourse in the Age of Show Business. It was on my to-read list far too long! Postman’s concern is that through the influence of television, visual stimulation became a substitute for thought and short-circuits introspection. Notice the subtitle of the book is: Public Discourse in the Age of Show Business. Not everything in life is amusing. Our world deals with many serious issues, and when we consider these issues primarily through the sound bytes of television, it impairs our ability to truly think and contemplate these things. The very nature of television discourages certain uses of the intellect, and it has spilled into everything. When our society was a print-based culture, it influenced public discourse differently. Reading a book about an issue is different than watching a television show about it. A book requires more of you: longer attention, concentrated effort, etc. This in turn affects how people discuss the issues. In a culture that was dominated by print, public discourse was characterized by more depth and coherent presentation of ideas. Postman shares the history of how speeches and sermons used to be delivered – and today we would be bored silly! Our attention span would be gone after the opening few minutes, and speeches and debates could then go on for as long as 7 (yes, seven) hours! And that last sentence is what I want to narrow in on. Do you have an active mind? The influence of television and the internet makes it more challenging for us to read books of substance and to have an active mind. We really must see the need to do so, and make an effort to stretch our minds. This does not mean…we should never watch television or use the internet. Obviously this is a blog, and I am utilizing this medium! There are good things about television and the internet, but we need to be aware of the downfalls. Neither does this challenge to read books of substance mean that you must read academic books! I encounter this misunderstanding sometimes. “Not everyone is academic.” A book of substance does not mean a book published by the academic arm of a publisher. Got that? There are plenty of books written for a lay audience that are simply more thoughtful in nature and require some contemplation. Books that are written not to entertain but to impart knowledge, understanding, and wisdom. The alternative to entertaining is not boring! But the sad influence of television has made us think so. We think something thoughtful is academic, when it is not academic. As Postman observed about television, when everything is presented as entertaining, this has in turn affected our books. If a book isn’t light or entertaining in some way, we have a hard time getting through it. It is disheartening to look at the best selling Christian books because far too many are superficial, and we don’t even realize it because this type of book has become commonplace. I’m certain this has hindered Bible reading as well. I also think it has hindered our ability to read a book discerningly: To discern whether a book is biblically accurate or not; and to properly perceive whether a book is feeding us spiritually or feeding our ego. We have become thoughtless consumers, rather than thoughtful consumers. Ouch. That’s an indictment. But one we need to hear Christians. There is nothing wrong with being entertained, but there is a problem when we are being entertained to death. **For more on how the internet has affected us, consider this book: The Shallows, What the Internet Is Doing to Our Brains by Nicholas Carr. Brief info here. “What happens when the primacy of worship fades, and there are no more spires in your world? Thanks for sharing this Laura! The excerpt is compelling, and I will read the entire article. The entertainment culture no doubt has increased the self-focus, distracting us from what really matters – the eternal. Must have missed this the first time around. Glad you re-posted. This is really great. I’m very leery of any sort of entertainment that is tied directly from the church. I think we should utilize social media, TV and so on as a way to share the Gospel, but it should never be watered down.